How much does it cost to travel to Bath? How much money will you need in Bath? £113 ($147) is the average daily price for traveling in Bath. The average price of food for one day is £35 ($45). The average price of a hotel for a couple is £129 ($167). Additional pricing is in the table below. These average travel prices have been collected from other travelers to help you plan your own travel budget. How much money do I need for Bath? 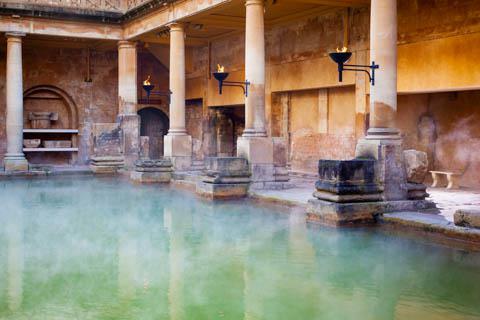 Bath is most famous as a historic spa city, and as such, it has been declared a UNESCO World Heritage Site. It is only 100 miles west of London and it is a wonderful, historic city with excellent architecture and great hot springs. It's a popular travel destination for international visitors and Brits alike. It is charmingly positioned in the rolling hills of the Somerset countryside just south of the Cotswolds. The city itself has a population of about 80,000 and gives you a sampling of attractions including a range of restaurants, theaters, pubs, and museums. Bath was first established as a spa city during Roman times when an intricate network of baths were constructed. It continued to grow and thrive into medieval times and into modern history. It was heavily damaged during World War II and during reconstruction there were some modern buildings that were built in unexpected, if not awkward places. Bath has a temperate climate that is slightly wetter and milder in temperature than the rest of the country. July and August are the warmest months when the averages highs are around 21 degrees Celsius. During the winter months the average lows are just around freezing. Bath is a wonderfully historic city with great Georgian architecture. Some of the major sights include the Roman Baths, where you can see the original baths and learn about the city's history. Also be sure and visit Bath Abbey, which is located near the Roman Baths. Stroll along Great Pulteney Street with its beautiful gardens and don't miss seeing Pulteney Bridge, which is one of the few bridges in the world that has shops spanning its entire length. With so much to see and do, you will surely want to spend an entire weekend in Bath. The City Centre is where you'll find most of Bath's history, culture and attractions. This is where you'll likely spend most of your time as a tourist. This is where you'll find the Museum of the famous Roman Baths and there are some good shopping areas between the Royal Crescent and Brock Street. Oldfield Park is where many families and students live. There's also a main shopping road that's called Moorlands Road. It has many local shops, restaurants and several good quality charity shops. Bear Flat has a shopping area that is identifiable by the polar bear on the roof of The Bear Hotel. You can walk here from the city centre and there are good views from Alexandra Park. Walcot is the city's "alternative" area. There are many boutique shops and small pubs that have a lot of character. There are also some nice Georgian houses in the area. Widcombe is across the river and can be accessed by the Halfpenny Footbridge. There are some independent shops on High Street. Bath is the only place in the country where you can take a bath in hot, natural waters. The Thermae Bath Spa is located across the street from the Roman Baths. This is a modern spa that uses "healing waters" to sooth and relax. The water is warm and calming. The outdoor roof top pool has great views of the city. There are also massages, steam baths and more available. The historic Theatre Royal is close to the city center. It originally opened in 1805 and has shows year around. You can see anything from folk singers, to comedians, rock or opera here. You don't typically head to Bath for its restaurant scene, which can be lacking, but there are some interesting options if you do research ahead of time. Most restaurants are spread throughout the city so if you're not up for a lot of walking or are particularly hungry it's better to look online ahead of time and pick a specific place to go. Pubs are generally the most affordable option and have typical pub fare at a reasonable price. If you're looking for something more interesting then you may be in the wrong city. There are some options, but definitely understand where you're headed ahead of time. Because Bath is quite compact and pedestrian friendly, the easiest way to get around is on foot. There is an adequate bus system if you need to cover a greater distance, but cars are definitely not necessary, or even recommended as parking can be difficult and frustrating. In general, taxis are a better option than the public bus. If you are traveling with someone else then it will probably be cheaper as well. Buses in Bath are significantly more expensive than most other cities in the United Kingdom. There is a 'Park and Ride' bus system that runs from the car parks that are just outside of town. This is your best option if you plan to arrive at Bath by car. There are tourist buses available as well that travel to the main attractions around town. You can pick them up anywhere on their circuit or at the start ("Bog Island" for the Skyline tour or by the fountain near Bath Abbey for the city centre tour). These are hop on hop off tours so you're free to get on and off as you wish.